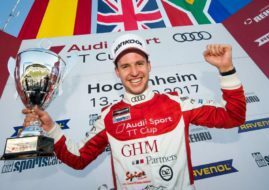 The fourth round of the 2017 Audi Sport TT Cup took place at Zandvoort Circuit in Netherlands, as the part of DTM weekend. The winners of two races are Philip Ellis and Mikel Azcona, two drivers who were on the top of the championship standings before the event. After seven races, Ellis has four wins and 160 points while Azcona collected 127 points with three wins. At Zandvoort, Ellis was the fastest qualifier for the Race 1, converting his pole position into victory, ahead of Azcona and Tommaso Mosca. Gosia Rdest finished in the fourth place, ahead of Keagan Masters. In the second race, Mosca was the pole-sitter but he finished only fifth. Azcona won the race ahead of his main rival Ellis. Masters captured his first podium, ahead of Milan Dontje. The guest drivers at Zandvoort were former F1 star Giedo van der Garde, an actor Daniel Roesner and motorsport journalist Roman Wittemeier. Van der Garde was 12th in the Race 1 and 7th in the Race 2.